Gov. Bill Walker’s plan to revamp the state’s financial structure and narrow a huge budget deficit is getting good marks in the financial community. Standard and Poor’s likes it, but adds that it doesn’t go far enough. Standard and Poor’s is one of the state’s credit rating agencies and issued a warning in August that the state was facing rapid downgrades from its top “AAA” rating if action was not taken in the next legislative session to put the state on a more sustainable path. In Alaska’s financial community, Joe Beedle, CEO of Northrim BanCorp, sees it as very positive, but adds that Walker has to get a lot more aggressive on the state fiscal gap. So far no one is throwing bricks at it because of a likely reduction in Permanent Fund dividends. That’s a good sign. State Attorney General Craig Richards unveiled the plan, which has been in the works since last January, in a luncheon address to state legislators in Juneau Oct. 28. The plan has taken various forms over the last few months and at one time involved an arbitrage concept where large sums would be borrowed against the value of the combined state assets, something like a consumer borrowing against home mortgage equity. Walker ultimately backed away from that as being too risky, according to sources familiar with the working group the governor had assembled. The core of the current plan, as Richards explained it Oct. 28, is to bulk up the state’s Permanent Fund, now with a value of about $53 billion, by transferring in other state savings accounts like the Constitutional Budget Reserve, or alternatively putting funds now in the state Constitutional Budget Reserve into the Earnings Reserve account of the Permanent Fund. Richards said the combined value of the state’s liquid assets, counting the Permanent Fund, CBR and certain other funds, but not including pension funds, total about $60 billion. An important change in the plan is that oil tax revenues would flow directly to the Permanent Fund and additional oil royalty income. Currently, 25 percent of oil royalties and lease sale bonuses go into the Fund. Walker’s plan would increase that, so that all oil production tax revenue and half of state royalty oil income (in addition to the 25 percent now dedicated by the state constitution) flow into the Permanent Fund rather than the state’s general fund. The remaining 50 percent of oil royalties (net of those dedicated to the Permanent Fund), would finance the annual citizen dividends. Currently dividends are funded by earnings from the Permanent Fund itself, on a five-year rolling average. Other, non-petroleum tax revenue would continue to go to the general fund as well as certain oil taxes that are not as volatile as production taxes and royalties, Richards explained. These include the state corporate income tax on oil and the state property tax on oil production and transportation property, he said. If the plan were adopted, the estimated revenues for fiscal year 2017, the state budget year beginning next July 1, would be about $3.3 billion, according to preliminary estimates by the governor’s working group. In contrast, state oil revenues paid to the state general fund in the current fiscal year 2016 will total about $1.55 billion. Non-petroleum revenues would flow to the general fund as they do now and are expected to total $550 million, according to the estimates. Other petroleum revenue, the corporate and property tax income, would contribute $275 million, and would go to the general fund. These bring total state revenue under the plan to $4.125 billion, Richards said in his presentation. Assuming a fiscal year 2017 state unrestricted general fund budget close to the current fiscal year budget of $5.18 billion (the governor is expected to introduce his actual FY2017 plan soon) a $1.06 billion gap is still left. “That is manageable,” Richards told legislators Oct. 28. The combination of new budget cuts and possible new tax revenues could make up the difference, he said. The theory behind the plan, which is being described as an endowment, is that placing oil revenues into the Permanent Fund rather than the general fund would allow the Fund to absorb the shocks of oil volatility rather than the state general fund, the attorney general said. In the general fund, sharp dips, or spikes, in revenues have direct effects on budgets. “During periods of high oil prices the state capital budget grows and so does the state operating budget. When there are drops in oil revenues capital spending is cut abruptly and the operating budget is also cut,” Richards said. Spikes and cuts in budgets have unsettling effects on state and municipal governments and there are also economic effects. With the large Permanent Fund smoothing out the effects of revenue shocks and sudden windfalls, a payout formula from the Fund could maintain more stable payments for the state budget, which would provide more stability, Richards explained. In operation, Walker’s plan maintains the current procedure of the earnings of the Fund flowing to the Earnings Reserve account. The Legislature can then appropriate funds from the reserve account to the general fund to support the state budget, following a set payout formula. The earnings reserve now holds about $9 billion. The state constitution prohibits spending money from the principal of the Permanent Fund, but money accrued in the Earnings Reserve can be appropriated, although the Legislature has never done so. Details of the plan are still being worked out, including the payout formula, Richards said. For the payout, the concept being looked at most closely is a set percentage of the total market value of the Permanent Fund. This approach, called POMV in shorthand, is used by most large endowments managed by major universities and charitable foundations. Other payout options are possible, Richards said, such as a fixed annual payment that could be inflation-adjusted. If POMV is adopted, most discussions of a sustainable payment percentage sustainable fall into the 5 percent range of the Fund’s total value, although some argue 4 percent or 4.5 percent might be a safer approach. The Permanent Fund’s long-term earnings average has been about 8 percent but that must be adjusted downward to account for inflation. One complication in operating the Permanent Fund like an endowment is that the payout money can come only from the earnings reserve unless the state constitution is amended. That’s because the constitution prohibits money from the principal itself from being spent. As long as there is sufficient money in the earnings reserve (it holds $9 billion now) there would be no problem making the annual cash draws. At this point the current balance of the reserve is sufficient to fund three years of $3-billion withdrawals, with the expectation that over three years the earnings of the Permanent Fund would replenish the reserve fund. “However, a large withdrawal (by the Legislature) or a series of bad investment years could draw the Earnings Reserve down,” a danger, Richards said. The governor’s team is still wrestling with the payout formula. While Walker’s plan would insulate the state general fund from oil revenue shocks, it would also make the annual citizen dividend more vulnerable to shocks. It would also reduce the dividend, Richards said. If the plan were in effect in fiscal year 2017, the dividend payment would be about $1,000, down from the 2015 payment of $2,072. Mark Edwards, a Northrim Bank economist and vice president, said that if the 2015 dividend had been capped at $1,000 if would have reduced the $3 billion deficit by $500 million. Meanwhile, an immediate advantage of putting the CBR fund into the Earnings Reserve, which is managed the same way as the Permanent Fund, is that the CBR assets would be managed more for the long term and invested more aggressively, with higher returns expected, than the more conservative approach now used for the CBR because the fund must be kept liquid to fund state operations. Edwards said that if the CBR were invested like the Permanent Fund it might earn $500 million per year in additional revenues. The governor’s plan has drawn a positive reaction from Standard & Poor’s, the agency that sets Alaska’s credit rating for bonds. On Aug. 18 the agency had revised Alaska’s financial outlook from “stable” to “negative,” although the state’s good AAA rating was not changed. However, the plan doesn’t go far enough, Standard and Poor’s said. “The proposed reform is significant. It would reduce the structural deficit by 65 percent. However, when it comes to the state’s credit rating, it may still be insufficient because it would leave the state with a $1.06 billion fiscal gap (based on FY 2016 expenditures),” the agency said. S&P also cautioned that the plan assumes a 6.7 percent rate of return compared to the 10-year average of 6.4 percent. Beedle said he sees positives in what Walker is proposing, except that the governor should be more aggressive in pushing it, along with other revenue measures. 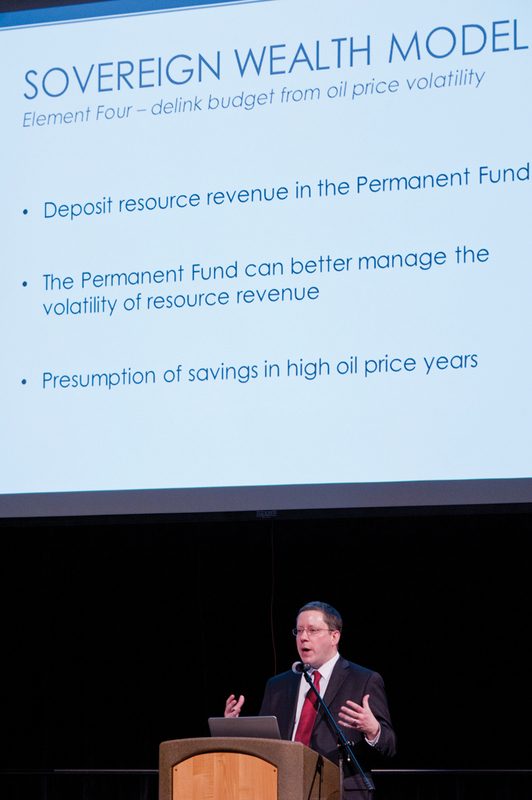 “We will need to use every tool before all the cash is gone,” meaning the CBR fund is depleted, Beedle told an Alaska Miners Association luncheon in Anchorage Nov. 3. The CBR is expected to be drained in 2019 if no action is taken. Using Permanent Fund earnings, restricting the growth of the PFD and use of revenue-anticipation notes will be needed to get the state through the new few years, Beedle said. “We believe broad-based taxes must be there, too. Everyone has to have skin in the game,” he said. Beedle also said Walker may not clearly understand, or is not communicating, the seriousness of the situation in his statements. “The governor says we’re wealthy and that we have $100 billion in assets. However, much of that including the Permanent Fund and pension funds is restricted and cannot now be used,” he said. The state’s annual financial report put unrestricted assets, which can be used, at $30 billion three years ago. In the most recent financial statement, for fiscal year 2014, the state’s unrestricted assets were $15 billion. “I agree with the governor that we have the potential for great wealth, particularly in natural resources, but our cash balance sheet is actually shrinking,” Beedle told the miners. Other critiques of the plan are beginning to emerge. One source familiar with the history of the Permanent Fund, the dividend and state government, who asked not to be identified, said the plans rests on a yet-to-be developed mechanism that would govern payout to the general fund from the Earnings Reserve. It is not yet clear just what kind of POMV or other mechanism will be proposed and the concern, the source said, is that a “black box” formula will be developed that will be complex and difficult for the public to understand. If that is the case there will be a lack of transparency and opportunities for state officials, or legislators to tweak the formula in ways that would generate more revenues. Legislators have been known to tweak formulas in the past, for example formulas used in estimating state oil revenues, to appear to predict more income that could be, and was, appropriated for capital projects. Another concern, according to the source, is in “de-linking” the dividend from the financial performance of the Permanent Fund by tying the dividend directly to oil income. This would dilute the public’s direct interest in financial management of the Permanent Fund, which was one of former Gov. Jay Hammond’s key goals in promoting the dividend in the early 1980s.